We were so busy when we were in New York that I’m going to have to keep coming back to it to cover all the things I want to remember. We had some great food experiences in New York. I think that if you’re even slightly passionate about food (like most of the planet) and visiting places you may never, or only rarely, come back to, you need to put some thought into your eating plan. What kind of foods appeal most? What is in season? What is the area famous for? Then get recommendations from online, from friends, from tv shows, from cab drivers and work out how and where to spend your few precious meals. If I was on a holiday for a couple of weeks I’d have breakfast, lunch, dinner and at least two snacks in between in order to try everything. But when you’re away for a long time, as we discovered with alcohol, you can’t live every day like it’s the weekend or things go pear-shaped. When I say ‘things’ I mean ‘my torso’. Everyone who comes to the states on holiday warns that weight gain is unavoidable – so many good things to eat and everything comes with fries and sides, drowned in dressing and deep fried. New York definitely wasn’t like that.Healthy food was pretty easy to get. They have these great places there, a type of deli, where it’s a bit like a canteen with help-yourself bain maries and they charge by weight. Sure, some are mac and cheese or deep fried chicken, but you can also get a pile of steamed broccoli or fresh fruit and it’s not too expensive. This was a very appealing option when we needed a break from eating pizza and cooking for ourselves wasn’t an option. 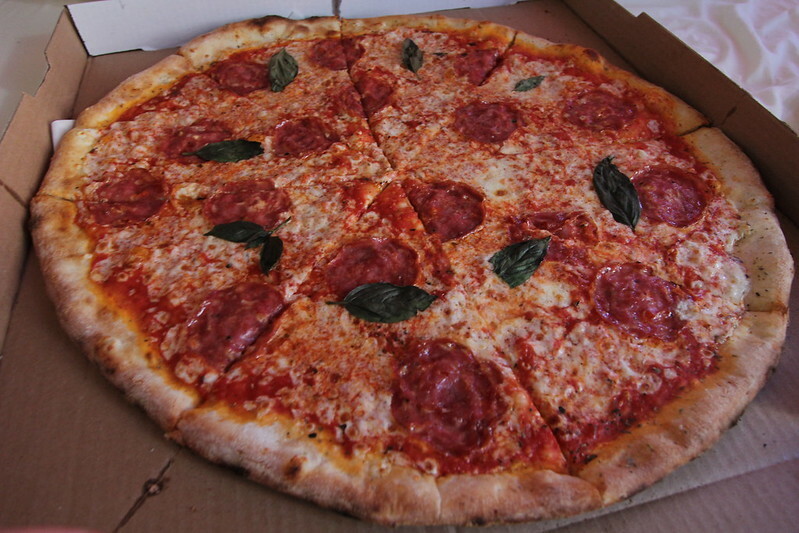 Pizza is something you have to do in New York. Luke’s a big pizza fan and obviously I don’t mind it either because I have tastebuds. Luke read up on the subject and it seems people in New York take their pizza very seriously. The criteria for pizza here is different to home. The base is usually super thin, although most pizza places also offer Sicilian or ‘Grandma slice’ which have a thick base. Topping are scanty compared to home, the focus is on the crust, the sauce, and the cheese. People differ in what they think makes for the best pizza – so all you can do is get a few names and go out and compare for yourself. Don’t forget to call it a pie. Here’s a list of the places we tried, all were recommended as being among the top pizza places in New York – although about a hundred pizza places probably fill that bill so don’t think of this as definitive. John’s Pizza on Bleecker St. This place is old and looks it – people have carved their names into just about every surface. We got there at 6 and still had to wait a few minutes. Get there any later and you could wait quite a while, although the service is extremely fast. You can only buy whole pies here and they’re about $20 depending on toppings for a small. Small is still pretty big though and was enough for the two of us (although we’re not really big eaters). The pizza here was definitely good but I discovered that there’s about a five minute window between thin pizzas being the same temperature as the centre of the sun and the cheese congealing. You just have to bow to inevitability and cram it all into your mouth as quickly as possible. Also in Greenwich, this take-away place was featured in one of the Spiderman movies – or so their advertising says. They sell pizza by the slice and whole. There’s a few stools to sit on but mainly people just stand around eating or take their pies away. We tried their Sicilian. Again, really good and the base was super fluffy and the very bottom had a great crunchiness to it. We had a slice of pepperoni as well, which was also good but I liked the thicker pizza better. Our last stop in Greenwich, I’m not sure if Arturo’s do take away, it’s a proper restaurant and has a piano and people singing in a kind of informal manner. The vibe is really nice and, despite being pretty crowded (we could hardly get into one of our chairs) I’m sure that if we hadn’t been sitting next to a table of shouters it wouldn’t have been too noisy. We ordered a cheese pie and arugula salad. I’ve been in love with rocket and pizza since forever and the salad here was perfect – small leaves dressed in olive oil with a little parmesan – perfect for piling on top of the pizza. Another place where it’s worth getting in early – a rule that pretty much stands for anywhere good in the city, although locals seem to prefer lining up rather than eating before 7. This time in Williamsburg and on the same block as our accommodation, we couldn’t go past somewhere called ‘Best Pizza’. We actually ended up eating their pizza twice. The first time was on our ‘down’ day when we pretty much stayed in bed and gave our tired feet a rest. We got a whole pizza to take away – they only do one size, 20 inches. Which is huge. The box was the size of a small coffee table. Their pizza is super thin though, so really… it wasn’t *that* bad. The next time we went was on our way home from a night out and we just bought a slice each and did some people watching. The cafe itself is interesting – patrons draw on paper plates and then the plates are stuck all over the walls and ceiling which makes for lots of things to look at while you wait for your pie. We hid the box under the bed because it didn’t fit anywhere else. Speaking of NY pizza terminology, the word ‘pizza’ is often used in signage and on menus, but when ordering you either want a whole pie, or a ‘slice’ – not a piece. White pie is pizza with sauce and white cheeses on it and usually nothing else. I asked for ‘a pepperoni pizza to take away’ when we were in Best Pizza. I should’ve asked for for ‘a pie with pepperoni to go’. ‘Pizza’ and ‘pie’ have the same roots as ‘pide’ and ‘pita’. They all essentially mean the same thing. We didn’t just eat pizza in NYC though. We ate a few times at a place called The Olive Tree in Greenwich. It did great mac and cheese and there were always tables free. We ate hot dogs from street vendors (not bad.. not great) and we also tried some hip bbq food in Williamsburg on the recommendation of two friends. 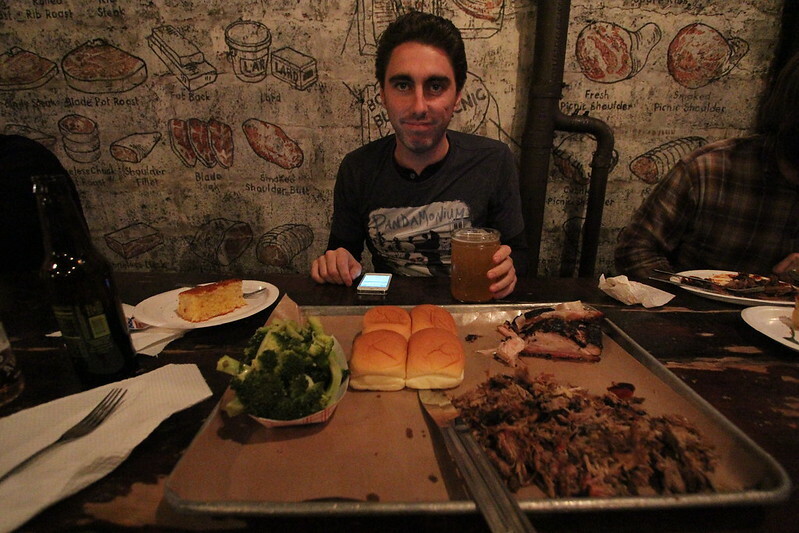 One of Williamsburg’s most hip restaurants, Fette Sau does bbq food – you buy as much meat as you want (by weight), it gets heaped on a tray with the sides you choose and you sit at a long bench table with strangers. A tv on one wall shows a fire… I think it’s supposed to be ironic. Our pork belly, pulled pork, rolls and broccoli. The cornbread was a new experience – tasted a lot like cake so we ate it for dessert. 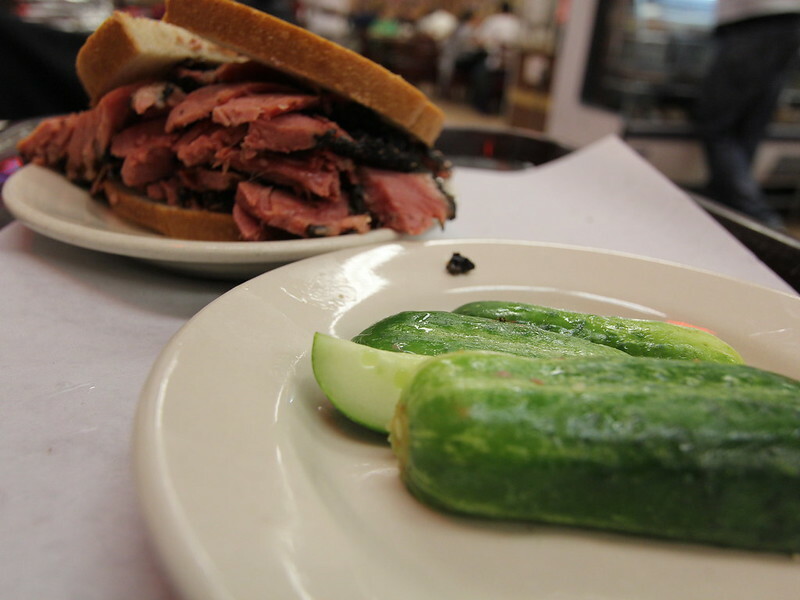 If one eating experience shouts ‘New York’ louder than any other, it’s Katz’s deli. The scene from When Harry Met Sally – you know the one – was shot here. The walls are lined with photos of famous clients and there is a protocol here that can’t be denied. You get precisely two seconds, once you get to the front of the line, to shout your order ‘pastrami on rye’ (if you choose) to one of the extremely beefy guys behind the counter and they carve about a pound of meat and slap it between two pieces of bread. I got the pickles too, which made a nice crunchy accompaniment to the sandwich. The pieces of bread aren’t out of the ordinary – it’s the meat that blows your mind. A trip to Katz’s is a must do (for the non vegetarians, anyhow) but do not go right on meal times. They’re open 24 hours on the weekends so a late night trip would probably make the experience less hectic. Luke looking fearfully at the decor. 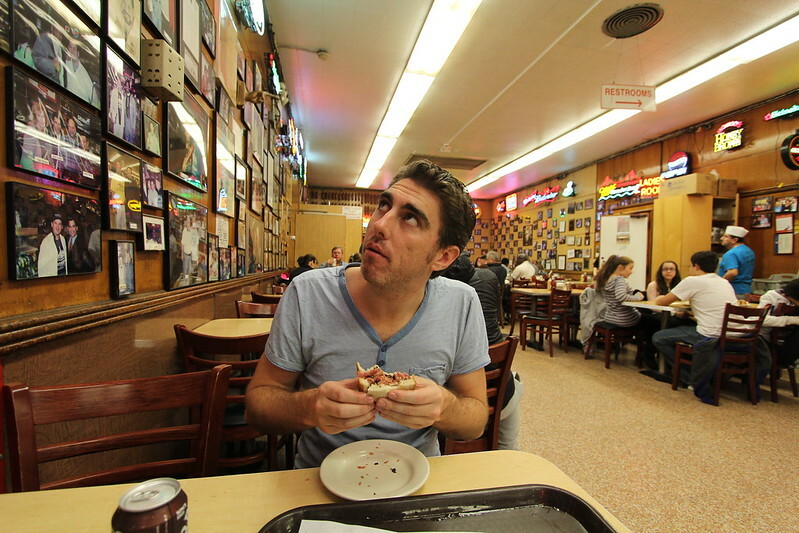 So essentially, there’s a whole lot of great food to eat in New York. We ate lots of it and barely scratched the surface. If you’re reading this and you’ve been to New York I’d love to hear about your best dining experiences. Tell me! I had some really terrible (well, not terrible, but definitely mediocre) pizza last night in Melb. I should have just stuck with the place nearby that I know that does NY style pizzas. My money would have been far better spent. Heh, I liked the NY style ones, but I think my favourite is still Pizza Heart in Blackburn. Aussie pizzas have so much more cheese! That description of NY pizza sounds like the pizzas you find in (non tourist trap) Italy – super thin base, crispy puffed/hollow crust, perfect sauce and cheese, simple toppings. Yum! Indeed! We had a pizza like that in Venice. I’d go back to Italy for the food any day. Every meal was divine! What happens if you take more than 2 seconds to order? They ask someone else! It’s like a madhouse.